US business groups on Monday urged vice president Joe Biden to press India's leaders this week to reverse course on a number of government policies they said unfairly harm American companies that do business in the world's largest democracy. "Unfortunately, many US companies are facing serious issues doing business in India," the US Chamber of Commerce, the National Association of Manufacturers and some 40 other groups said in a letter to Biden, who will meet with Prime Minister Manmohan Singh in New Delhi on Tuesday. "These issues are systemic, going far beyond any one industry sector," the business groups said. The letter was the latest sign of US frustration about the business environment in India. In recent months, American lawmakers and business groups have repeatedly asked President Barack Obama's administration to increase pressure on India to change its policies. US drug manufacturers are particularly upset by Indian decisions that have denied patent protections for certain drugs made by Pfizer, Novartis and Bayer, to the benefit of India's generic drug companies. 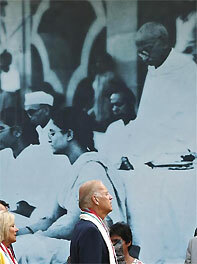 "The United States must make it clear to India's top leadership that barriers to free and open trade between India and the United States must be addressed if our close economic and diplomatic relationship is to continue to grow," Stephen Ezell, senior analyst with the Information Technology and Innovation Foundation, said in a blog about Biden's trip.